Amy Skinner embraces a training philosophy based in Classical Dressage and sound horsemanship practices. Amy keeps the best interest of horse and rider in mind, choosing to avoid fads and quick fixes, but to seek continual learning from the best teacher: the horse. Amy offers a training program for all breeds and disciplines that focuses on promoting softness, balance, and relaxation. She believes that any horse can improve given enough time and understanding, and that force and dominance play no part in building a strong relationship. Working with the horse’s mind develops confidence, and an understanding of biomechanics develops correct and sound movement. Amy also offers lessons and clinics, with a focus on providing information in a way that best suits each student. Amy believes that good teaching mirrors good training: offering information in a way the student can understand, and without judgement or force. Amy’s philosophy of training through relaxation carries over to students working to gain better balance and feel with their horses. She believes that learning should be fun and not intimidating, and she provides a safe, enjoyable atmosphere for riders to improve their abilities. A happy horse is balanced mentally, physically, and emotionally, and the same goes for a happy rider. Balance comes into play in many areas: between work and play, friendship and leadership, and many other areas. Everything is built on trust. We must be aware of our horses’ thoughts, needs, and more – building trust with every interaction. Respect is not gained through intimidation or mistreatment. Respect is earned. Learn to be a real leader for your horse. Amy Skinner is a rare being. She understands and reads horses and always gives them the benefit of the doubt. People talk about softness to the point that it has almost become a cliche without meaning. Amy's whole approach in everything she does with horses involves a softness and critique of her communication. 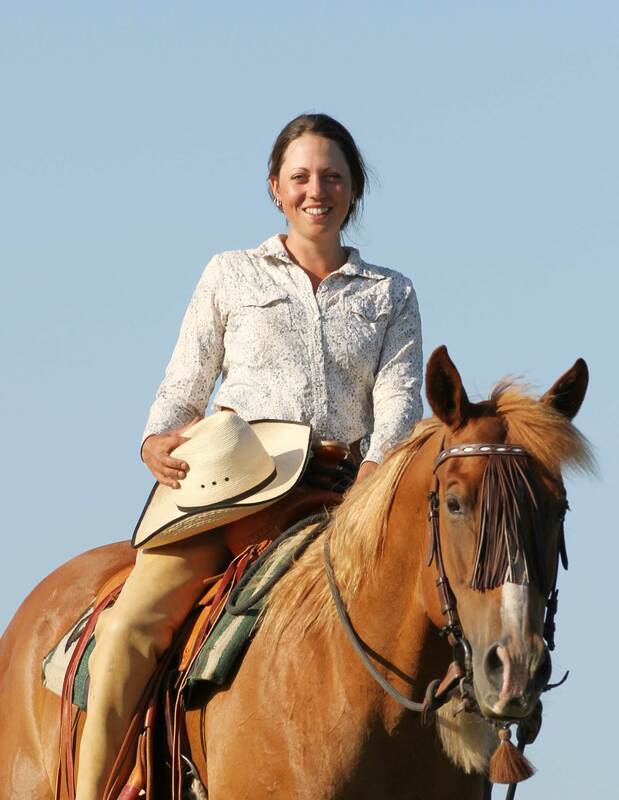 Amy is an inexhaustible learner and has reached a point in her career where she has accumulated her knowledge from numerous sources and reached her own high level of horsemanship. I would never hesitate to ask her opinion or for help with a horse and I often have. I have not even mentioned her unique ability to teach and to articulate complicated concepts to people. She is also caring and very respectful, Unfortunately not something you always see in the world of horse trainers. I consider her to be one of the best and although she may still be under the radar, with talent like hers, I don't expect her to be there for long. Amy is experienced and wise beyond her years. She can combine horsemanship, dressage and feel to provide you with the best approach to understand and improve your relationship with your horse. We’ve worked with her in various capacities; riding lessons, participated in her horsemanship clinics, sent our Lusitano to her for a month of summer boot camp (she also provided riding lessons) and I can’t say enough how wonderful every interaction has been. She has a great affinity for teaching and explanation and does so with kindness and softness, using both evidence based methods and her vast experience with horses of all backgrounds. All of that and she is an amazing writer and so fun to work with. We miss her in Michigan. My horse probably misses her most of all. Amy is a joy to work with. She is peaceful and kind, and committed to always putting the horse first. Without patronizing, Amy is able to help the rider understand feel and learn to respond to the horse with kindness and softness. Amy is always respectful and knows how to focus on the positive to move the horse and rider towards success and harmony. Amy is so intuitive to each horse she is introduced to! Amazingly talented and patient. She goes the extra mile it takes to help you and your horse understand and learn. She knows that you can only learn without pressure and she examples of what she is explaining make things crystal clear! Amy is a thoughtful and skillful trainer. I had the opportunity to take a lesson from Amy in Maine recently. After asking me what I hoped to work on with my horse and her careful observations, she was able to pinpoint exactly what was going on with my horse. His hind end doesn't track behind his front, in other words, he has too much disengagement of the hind. This made it difficult to get a balanced lope without him cross-firing. Amy has given me exercises to help my horse balance and for me to alter my weight and cues at our turns. Thanks so much, Amy, for your dedication to horses and riders having a better relationship! Give your horse a correct foundation and set him up for success in life. Don’t skip this critical phase. This is the foundation of your horse’s riding career. Let’s talk about making that happen for you and your horse. Get balanced and create solid partnerships, no matter what saddle you’re riding in. I offer private or group sessions for all disciplines and breeds. Correcting or rebuilding a shaky foundation to helps create understanding and mental balance in both you and your horse. Mental and physical rehab are often closely connected, learn how we can help your horse. "It’s real natural fo the horse to feel like you are his way when you are actually in his way." "When the horse is a tool to a person that has no interest in understanding their horse or in becoming a better horseperson, it may make sense to bring the horse to the level of the person. But if the person is interested in the horse, the person should be helped and encouraged to rise to the level of the horse." "Your horse doesn’t care who you’ve ridden with, what you know or what your philosophies are…until you prove to him that it benefits him and has meaning for him." Give you and your horse a path for developing quality horsemanship. I am not available right now. Send us an email and I will get back to you shortly.